We would also like to recommend the sermons preached by Alun McNabb. These sermons can be found at sermonsfortoday. 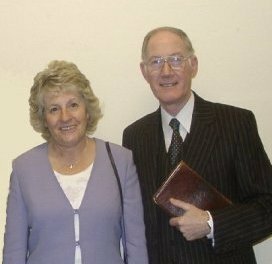 Alun McNabb was for many years Pastor of Priory Baptist Church in Dudley, West Midlands, prior to retiring. He is a well known speaker within the Evangelical movement. His preaching covers a wide range of subjects, from expounding the books of the Bible, such as series on Daniel, Isaiah, Jonah, 2 Timothy, Philippians and many more. But also in the selection of talks are series on the life of Joseph, lessons from Noah and a series on Bunyan's Characters. We have selected the seven most popular sermons which have been downloaded on many occassions and have been on tremendous help to people throughout the years. Please feel free to download and listen to these sermons.